My husband checked his work computer via VPN and the same issue presented, and that is on a completely different system in a completely different town. I checked for any errors on the server and they are none. I tested on three different computers from different locations across the country, trying three different browsers while being logged in and not logged in and I still can not reproduce any of the issues you mentioned. I see that there are others using the site and so far no one else has mentioned any problems. Have you tried deleting your browser history, cookies, and temp files? (03-16-2017, 05:50 PM)Mark Wrote: I checked for any errors on the server and they are none. After deleting as suggested, the error persists. I checked yet another computer from a different part of the state, they have never visited the site before, and are experiencing the same error. I am adding in the image of my screenshot, with the analysis of the errors popping up on the sight in the right hand of the screen. On the left you can see the misaligned upper toolbar. I'm so sorry and I don't want to be a bother, The site worked fine for a while for me and then it just suddenly stopped working and I'd love to be able to use it again. - The printer image is not downloading for you. The error that starts with, "A Parser-blocking, cross site..." is just a warning from Google Chrome but this should not affect anything. I made some changes but cannot confirm if they resolved anything since I cannot reproduce the problems. If the changes that I made do not resolve anything then I will contact my hosting provider and ask them what's going on. Thank you again for the extra info. Problems still persist. My husband, who is a network analyst at a University, took a harder look and thinks he might know where the problem lies. I've screenshotted our conversation as well, maybe it will shed some more light on what's going on. Thank you so much for patiently working with me on this. I considered the possibility of Cloudflare being the issue but their documentation says that 403 errors would be on the originating server and not them. However, since anything is possible I made an update that causes that script to bypass Cloudflare. So we'll see what happens. 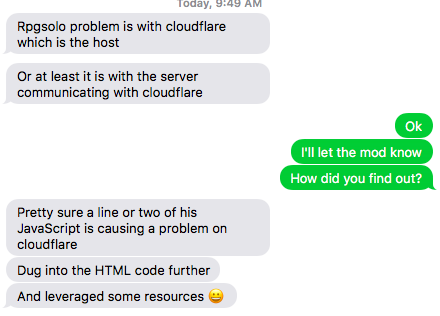 (03-17-2017, 02:41 PM)Mark Wrote: I considered the possibility of Cloudflare being the issue but their documentation says that 403 errors would be on the originating server and not them. However, since anything is possible I made an update that causes that script to bypass Cloudflare. So we'll see what happens. I'm going to let my Husband explain what he found, because he can discuss it in more technical detail than I can. The following is from him: the site is still having the same problems as before. It seems that the cloudflare issue is resolved as the 522 and 520 errors that were showing yesterday are no longer showing. However the 403 error persists. As mentioned this has been tried on windows 10, windows 7, android, iOS, and Mac osX. I have tried on a verizon cell backhaul, a comcast, att, and mediacom connection. I have tried firefox, IE10(32 and 64 bit), IE11, edge, Opera, Chrome, and Safari. I have tested on 4 windows desktops, a windows laptop, a microsoft surface 3, an iPad, a google pixel. It seems from the console of the page source that for some reason the main.min.js file is being blocked. When i go directly to https://www.rpgsolo.com/scripts/main.min.js (while not logged into rpgsolo) I get the following output : Your connection to this server has been blocked in this server's firewall due to multiple failed logins. Your IP will automatically removed from the firewall within 30 minutes. Please contact our support department if you are still blocked within 30 minutes and provide the following information: Your blocked IP address is 162.158.74.177 This server's hostname is phx11.stablehost.com. I get the same error when logged in or not logged in. (03-18-2017, 01:33 PM)geekalogian Wrote: I have tried on a verizon cell backhaul, a comcast, att, and mediacom connection. I have tried firefox, IE10(32 and 64 bit), IE11, edge, Opera, Chrome, and Safari. I have tested on 4 windows desktops, a windows laptop, a microsoft surface 3, an iPad, a google pixel. Yeah, but have you tried it on a Blackberry? Thank you for the extra information. I have opened support ticket with my web host and hopefully they will have the answer. Just checked and all the buttons seem to be working again! Thank you!!! The print link image is still broken but that could easily just be my computer being done. Clicking it still enables it to print. I really appreciate all the hard work you've done on this! I'm glad to hear. I wouldn't have figured it out without you and your husband's great detective work so thank you too for sticking in there.